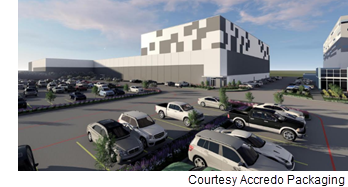 ​​​ SUGAR LAND – A sustainable flexible packaging supplier has ​started its third expansion on the 32-acre campus at 12682 Cardinal Meadow Dr.
Accredo Packaging is investing $50 million into constructing 200,000 sf of warehouse and manufacturing space that is expected to be completed by 2019. Phase one of the company’s Sugar Land Campus was built in 2009 and composed 170,000 sf. Phase two’s completion in 2013 resulted in an additional 175,000 sf. Accredo’s packaging is used for common products like snack foods, confectionary items, frozen food, beverages, and other household items found in retail grocery stores.